​For most people, the manufacturer’s manual is the final authority when it comes to the type of oil that you use for your car. For others, this does not come into play. Instead, you might opt to drop off the car at the mechanic’s for a much-needed oil change and trust that the professional knows what to do. For other people, DIY projects are not only limited to crafts and creativity. Your car’s oil change is your responsibility and you therefore find it important to know what oil is best for your engine. After all, this information will help you ensure that your engine is in the best condition. ​If you choose the right motor oil, you give your vehicle the chance to have a longer engine life. Motor oil lubricates your engine parts so that they do not grind against each other causing wear and tear. If you do not have the right motor oil, then your engine parts will need replacement within short periods of time. Apart from choosing the right motor oil, you also need to ensure that you change your oil once every 3000 to 5000 miles to keep the engine it top shape. The oil also keeps the engine cool. All the dirt and foreign particles are caught in the oil and if it is not changed out regularly, you will have dirty oil that is not as effective in lubrication and cooling as clean, new oil. Choosing the wrong engine oil can land you in a lot of trouble. It can void your warranty which would disqualify your vehicle from any repairs or maintenance that a vehicle is supposed to enjoy once they buy a vehicle. At the end of the day, the type of oil that you choose for your vehicle will determine whether or not you need to overhaul and change your engine. This is much more expensive than just choosing the right oil from the get-go and changing it as often as is required. ​The viscosity of oil is closely related to its thickness. If motor oil is thick, then it is more viscous. If the oil is thinner, it has a lower viscosity. In general, viscosity refers to the ease of liquid flow. 5w30 and 5w40 motor oils have the number 5 which is then followed by W. W represents winter and not weight. ​The oils therefore have the same viscosity in winter, which is 5 and relatively low. This means that the oils flow easier through the engine at very low temperatures. ​This is a good characteristic of motor oil. If you have very viscous motor oil such as a 20w, then it will not flow as easily through in low temperatures. ​This means that the oil may not be properly distributed through the engine when it is cold, ultimately leading to damage and wearing away of the engine. ​The number after the ‘w’ represents the thickness of the oil in normal or warmer temperatures. The 5w40 has a higher viscosity in warmer temperatures than the 5w30. ​Your climate and weather plays a significant role in the type of engine oil that you use for your vehicle. Lower temperatures will demand a lower viscosity. The oil flows easily through the system ensuring that the engine is at peak performance. This is why both these oils are suitable for colder temperatures unlike 10w or 20w oils. On the other hand, high temperatures require slightly higher viscosity but one that is not too high to hinder effective flow. You do not want oil that is too thin and easily flowing as it could have long term negative effects on your car. 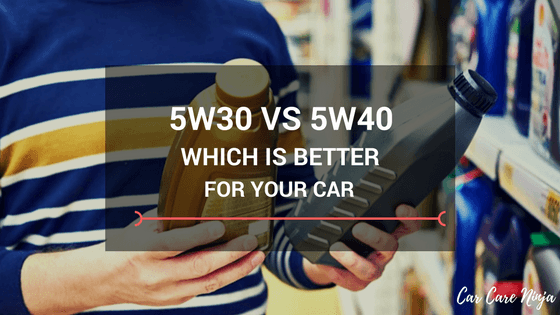 So which is the best motor oil: 5w40 vs 5w30? ​The 5w30 engine oil is the most popular in the market. It can be used for different types of vehicles and works well for a wide range of temperatures. Its versatility makes it popular among car owners although it is more preferred for winter periods although it can also be used comfortably in warmer summers. ​The 5w4o engine oil is not as popular as its counterpart. It is therefore not as widely used or common as well. Using this engine oil allows you to promote the health of your engine. It protects the engine from build up and sludge which ultimately prevents damage. It is also praised for its ability to move to all other moving parts fast and is thus effective in lubricating the engine. ​These two engine oils are largely similar. They both work well during colder periods thus lubricate the engine efficiently. The oil moves fast through all the parts thus making it easy to rev the engine when it is cold. Additionally, they are both used for warmer temperatures since the thickness provides the engine with sufficient protection. In fact, the only major difference between ​5w30 and 5w40 is the viscosity in warmer temperatures. ​This makes the 5w30 better suited for colder temperatures and the 5w40 better suited for warmer ones. ​You do not have to struggle when it comes to choosing the perfect engine oil for your car. First of all, even before you consider choosing between these two motor oils, you have to ask yourself, “What does the manufacturer recommend?” This is a very important guideline as it determines your warranty as well as the condition of your engine. Most people tend to choose the 5w30 because of its versatility. It is able to withstand a high range or temperatures making it ideal. It is also common and easy to find. The 5w40 is not as popular but is still as effective. You can use it for your vehicle if you find the 5w30 too expensive for you or if it is not available in your area.